A trusted and reliable communications solution that frees the user to focus on their mission. Dispatch tools that enable improved response time and consistent, failsafe reliability. Your radios, mobile data terminals and the systems on which these operate – P25, NC VIPER, Simulcast, VHF & UHF, Digital Radio and PSAP systems — is an integral part in the fulfillment of each public-safety officer’s job, from performing daily tasks to having the assurance that when seconds count, with one press on a button, help is on the way! The crux is this: First responders need communications that work, and a technical partner who safeguards this need. 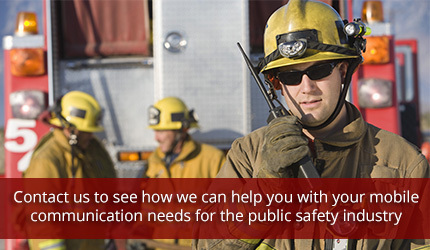 With over 75 years of combined communications experience and long-standing relationships with public safety, Mobile Communications has your back. Our understanding of the unique needs and requirements of Law Enforcement, Fire and EMS Departments, Public-Safety Communications Centers and the responsibilities of personnel in these departments is foundational, and we strive to improve and build-upon that foundation, each day, starting with listening to you!